Eschewing traditional notions of the equestrian farm, this 13-acre landform project functions as a riding facility with an indoor riding arena, stables for fourteen horses, gatehouse, and a utility barn. Designed as a net-zero project, it generates as much energy as it consumes, harvests rainwater for irrigation, and consumes no fossil fuels. The building footprint is integrated into the landscape through sustainable site design and balanced “cut and fill” excavation. 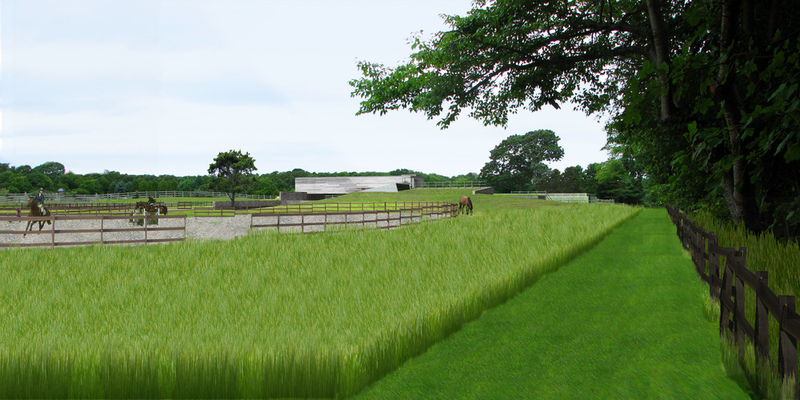 The removed earth is relocated to form berms to direct storm water runoff, planted roofs that provide thermal massing, and landscaped gardens and pasture for horses. An integrated rainwater-harvesting system collects runoff from planted roofs, bioswales, and a rain garden.